President Donald Trump announced on the White House South Lawn Friday that he will nominate William Barr as his next attorney general. 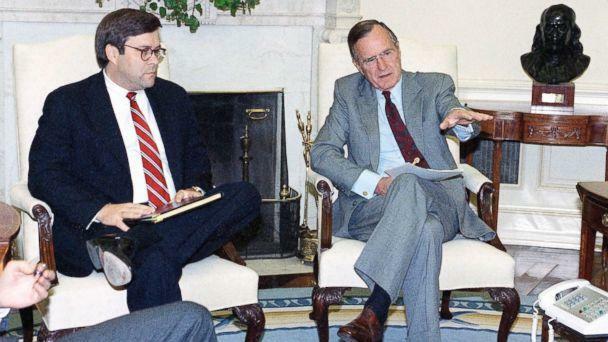 Barr served as attorney general previously under President George H. W. Bush. He must still be confirmed by the Senate and, if so, would oversee special counsel Robert Mueller at a critical time in his investigation that involves the president. "He was my first choice from day one, respected by Republicans and respected by Democrats," Trump told reporters as he left the White House on a trip to Missouri. "He will be nominated for the U.S. attorney general and hopefully that process will go very quickly, and I think it will go very quickly," Trump said. Speaking later at an event for law enforcement officials once he landed, he said there was respect for Barr from both sides of the aisle. "There's no one more capable or more qualified for this role. He deserves overwhelming bipartisan support and I suspect he'll probably get it," Trump said. Trump called Barr "one of the most respected jurists in the country, highly respected lawyer," and "a terrific man, a terrific person, a brilliant man." The president said he didn't know Barr before he began the search for a new attorney general. In introductory remarks for the president Friday in Missouri, acting Attorney General Matthew Whitaker praised the president's decision. "He's supremely qualified, highly respected and will continue to support the men and women in blue," Whitaker said. "I commend the president for this excellent choice." 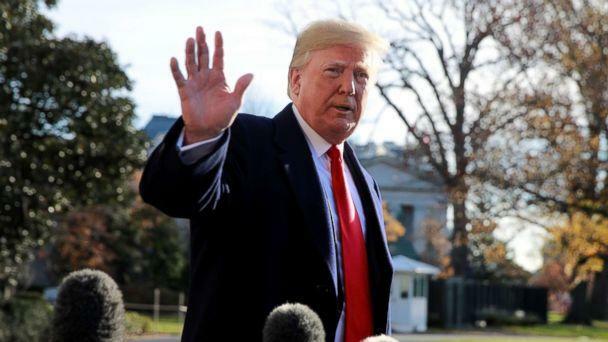 Trump had told advisers Thursday he intended to nominate Barr, multiple sources familiar with the matter told ABC News. The presidents' aides had previously floated the idea of Barr retaking his post in the Justice Department, sources said. The Washington Post first reported the news. Barr did not respond to ABC's request for comment. A source close to Barr said he is likely to accept the job if offered. In the early 1990s, as attorney general, Barr supervised Mueller in his work as head of the Justice Department's Criminal Division. Barr has been somewhat critical of Mueller's investigation into Russian meddling in the 2016 elections and has claimed there is more basis to investigate former Secretary of State Hillary Clinton for her role in approving the 2010 acquisition of U.S. uranium stockpiles by a Russian energy company -- a complicated deal that has come to be known simply as Uranium One. "To the extent it is not pursuing these matters, the department is abdicating its responsibility,” Barr told the New York Times. Sen. Richard Blumenthal, a Democrat from Connecticut, said in a statement Friday that he would demand a firm commitment from Barr to protect the Mueller investigation. As a member of the Senate Judiciary Committee, Blumenthal will be part of Barr's confirmation hearings. "I will demand that Mr. Barr make a firm and specific commitment to protect the Mueller investigation, operate independently of the White House, and uphold the rule of law," Blumenthal said in the statement. "The Senate must closely scrutinize this nominee, particularly in light of past comments suggesting Mr. Barr was more interested in currying favor with President Trump than objectively and thoughtfully analyzing law and facts." Sen. Patrick Leahy of Vermont, the top Democrat on the Judiciary Committee, said he has known Barr for many years and hoped he would uphold the rule of law and protect Mueller's investigation "against any interference." Leahy said Barr has "a long record in both the private sector and public service that needs to be thoroughly vetted by the Senate," including his recent comments "about investigations of keen interest to the president who is nominating him." Barr also supported President Trump's firing of former FBI director James Comey, writing in an op-ed in the Washington Post that Trump made the right move. "Unfortunately, beginning in July, when he announced the outcome of the FBI investigation into Hillary Clinton’s use of a private email server while secretary of state, he crossed a line that is fundamental to the allocation of authority in the Justice Department," Barr wrote in the 2017 article. "While the FBI carries out investigative work, the responsibility for supervising, directing and ultimately determining the resolution of investigations is solely the province of the Justice Department’s prosecutors. With an investigation as sensitive as the one involving Clinton, the ultimate decision-making is reserved to the attorney general or, when the attorney general is recused, the deputy attorney general." Barr also at one point took issue with the political affiliations of those on Mueller’s team, telling the Washington Post in July of 2017 that "prosecutors who make political contributions are identifying fairly strongly with a political party." Barr was referring to reports in the Washington Post that eight of Mueller’s prosecutors had donated to Democrats in the past. Republicans like Sen. Lindsey Graham, incoming chairman of the Judiciary Committee, issued a statement supporting Barr, calling him a man of the "highest integrity." Graham also noted that the Justice Department needed new leadership, a jab at former Attorney General Jeff Sessions. "Mr. Barr is highly capable, highly respected and will provide new and much-needed leadership for the Department of Justice," Graham said. "I will do everything in my power to push him through the Senate Judiciary Committee and onto the floor of the Senate for eventual confirmation as soon as possible." Richard Cullen, who served as a U.S. Attorney under Barr, describes him as a good pick for the role. "I have worked with him for over 25 years and I believe it would be a great choice," Cullen told ABC News. "He is a wise man with great intellect and skills and someone who has broad experience in both the government and business world."